I still don't get why This fire emblem numbers are soo low. With all the talk from last week about low stock, I actually was worried Switch would be notably lower than it was before, but just sub 48k is perfectly fine with me. I was worried Nintendo used up this week's stock the prior week and it'd be like a bit above 40k or worse or something. It will look great compared to 2 years ago after-Golden Week sales. At least it will be a good test for Switch hold power. Eh, not really. It's still supply constrained so it'll be sure to sell out. Not really, shipments were low for last 2 weeks, there is no way demand was satisfied. Zelda is slowly climbing to that magical million Switch is still doing well no Wii U situation confirmed + Minecraft coming this week so sales should stay stable till arms + splatoon. And ofcourse there still is supply constraints. Switch seems to get Vita like support too in Japan so that's very good. Honestly i am surprised how well the Switch is doing World Wide because in my honest opinion i thought it would take of around the holiday season. Reason is because then bundles and more games are out. Anyway i am happy that i was wrong Nintendo deserves it the Switch is a real fantastic product and playing Zelda + Mariokart at times i normally can't is very cool! And i want to ofcourse atleast to have between 2-4 more decades of Ninty games honestly imo all three deserve to be around for a while longer! Sorry for the last part being slightly off topic. I'm glad FE is holding on, I would like to see more remakes in the future. Bandai Namco, Konami, and Sega make a ton of money on other types of businesses, but you can basically subtract the entire revenues of those segments from the Japan total, and Japan still remains the largest region by far. The numbers speak for themselves. It's important to note that these are driven by mobile software, but let's be aggressive and cut sales by 2/3s or 3/4s or more to account for that, and Japan is still comfortably ahead. Proportionally, foreign markets are small to Japanese publishers. Of course they want to expand overseas, but the homeland will remain the most important for the foreseeable future. Almost 30k bump for Zelda! Nice hold this week. The Legend of Zelda: Road to 1 Million update! Along that same line, many thought MK8D would kill BotW legs. Given its only been two weeks, and last week was GW, but that isn't seeming to be the case as of yet. Most likely in the early 20's. It was absent in its 5th week also but came back on week 6 and stayed for four in a row until now. Hopefully it returns next week and we can fill in the blank from this week. If it keeps selling out week after week at 40K-50K during slow summer it would be a very good sign for Switch. Switch has the chance to outsell that whole week lol. It will reach it somewhere late 2018 or early 2019 is my prediction, does it include digital sales? Pretty sure BotW will get lots of GOTY's so a GOTY versionwith all dlc somewhere in 2018 is highly possible, wich ofcourse can give it a small boost it needs for dat 1m. Edit: the second dlc pack could also boost sales if it is highly praised. The first one seems like filler so i doubt that will boost sales. Switch has crossed streams with the Wii U on week 9. Took the PS4 85 weeks. Late 2018? I say more like early 2018 after the DLC hits and the holidays. I haven't extrapolated the numbers but I say by March 2018 it will be there. So within a year of release. it was reasonable to not expect this entry to get over a million. the fact it's beating expectations is probably blowing away many people. Combined, Breath of the Wild Switch + Wii U is currently at 559 177 (retail only). Pretty good, 600k in sight (I'd say sometime in late may/early june). I agree it was reasonable to expect it to not come close at first. Did Skyward Sword or Twilight Princess hit 1 million in Japan? Switch almost at 1/3 of Wii U lifetime sales in Japan after two months. 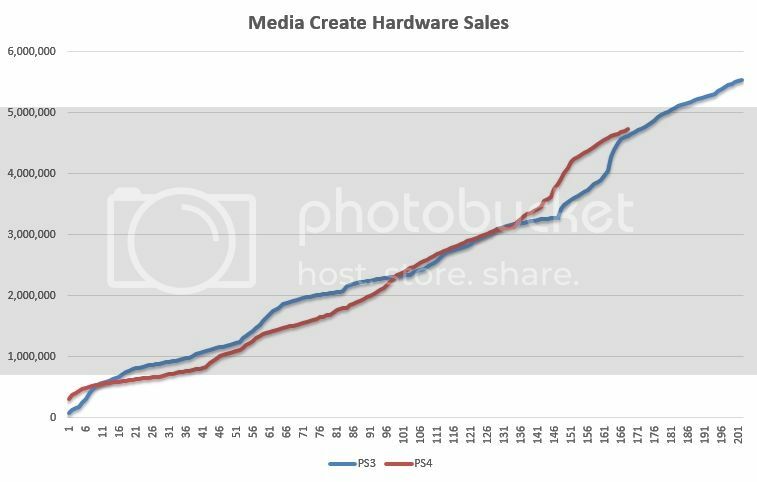 There are 7 weeks where PS4 and PS3 will be at close baseline... so the gap will shrink about 20-30k but PS4 receives DQXI at the end of these 7 weeks. 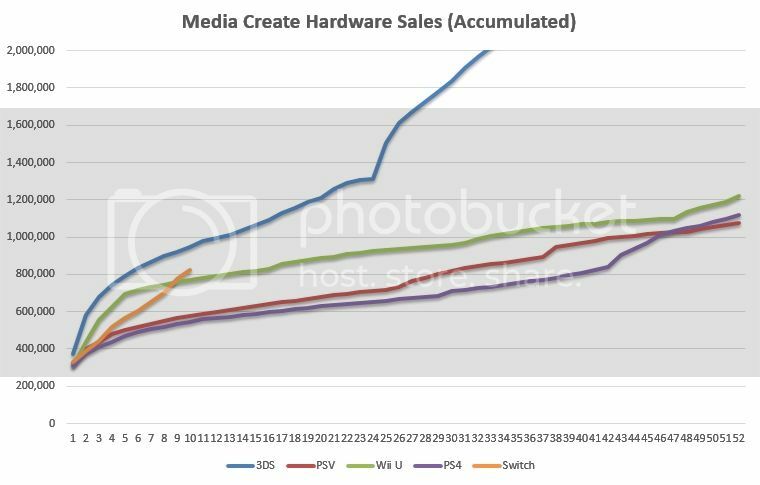 PS4 will cross 5m first with around 40-50k over PS3. Can't wait to see Dengeki's number for MK8D after the insane discrepancy from last week. TP is around 600k iirc (check last week's thread, someone posted exact numbers there). Why is Golden Week treated as something special? It doesn't seem to be any different from any other holiday for years now. These limited sales for Switch makes my estimate of ~200k shipped per month to Japan in non-holidays months (based in the 10m forecast) accurate. Because Golden Week I guess May will be a bit up with 250k shipped in the month. Both make way more from the oversea markets. Konami doesn't publish such data but you probably got how flawed is your analysis. Until Nintendo can up supply weekly. I'm surprised Nintendo didn't bump the shipment up to 75k or so for this week. I guess they're saving up for ARMS and Splatoon 2. I think they sell all Switches they produce instantly, they are not "saving up" things. Why should they? So that even more people fight for Switches when ARMS or Splatoon release? They just don't have the units, otherwise they'd be supplying bigger shipments worldwide. By the time splatoon releases they should've upped their production lines (doing that takes time). Supply constraints and Minecraft(even digital) might be enough to keep Switch sales steady until Arms and then it should explode with Splatoon 2. You know it's a holiday week when good ol' Mario Kart 7 pops back up in the Top 20. Nice to see good ol' Kirby back. Looks like it should end up around 600k LTD, which is pretty good. Capcom and Koei Tecmo also give regional breakdowns. 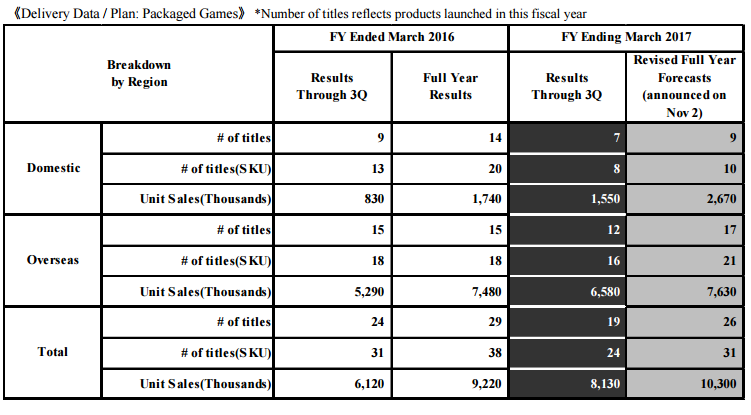 Capcom's biggest market seems to shift between NA and Japan quarterly depending on releases. Koei Tecmo's biggest is always unsurprisingly Japan, and usually it's more than NA, Europe and Asia combined. Gaiden was infamous for having really crappy maps iirc and the remake didn't change that part. Um Link to the Past (SNES) sold over 1M as well according to gamedatalibrary. Your general point still stands though. I wonder if the success of games like Nier is telling Japanese companies to try making something new as opposed to the previously proven game sequels? If anything, it seems like expected game sequels (FFXV, RE7, Yakuza) have declined in Japan, even if they went in very new directions (FFXV & RE7), but newer/unexpected entries (Nier, DQHeroes, Western titles like Horizon & Tom Clancy) are doing better than expected. Like at this point, isn't Nier looking to outsell RE7 & Yakuza 6 if it hasn't already (at least in MC, Famitsu has lower #s for it). Can Nier do 500k lifetime in Japan on PS4? Nintendo needs to boost Switch production into turbo mode. 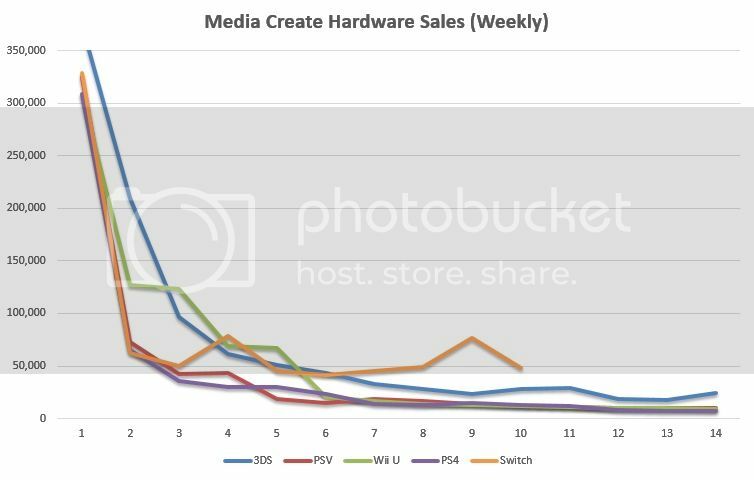 Otherwise, nice week for Nintendo. This is like a bad holiday gift from your parents, you wanted a Switch with Mario Kart 8, but instead you got a 3DS with Mario Kart 7.